with prizes from Showers Pass, North St. Bags, Toro Bravo, and more! July 27, 2012 – Portland, Ore. – Think you know your bike lanes from your bioswales? 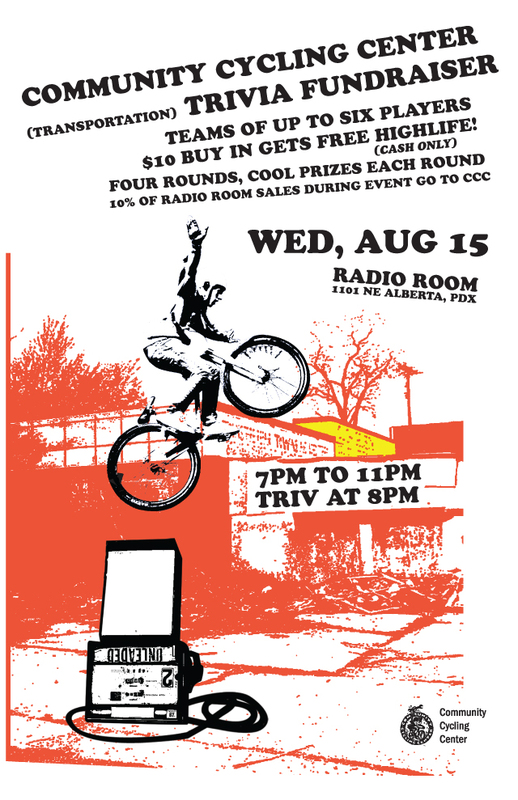 Join the Community Cycling Center on August 15th at the Radio Room for a benefit trivia night and put your knowledge to the test. This special evening will be dedicated to all of the local, national, and even international transportation trivia that you can wrap your mind around. Trivia teams can include up to six people, so bring your transportation nerd friends! $10 cash gets you a spot and a free Miller High Life. All entry fees go directly to the nonprofit, Community Cycling Center, and as a bonus, Radio Room will donate 10% of all food and drink sales from the evening. There will be four rounds of trivia, with prize giveaways after each round, including exciting gifts from Showers Pass, North St. Bags, Toro Bravo, and many more! View the Transportation Trivia Night flyer and Facebook event page. The Community Cycling Center, founded in 1994, broadens access to bicycling and its benefits. Our vision is to build a vibrant community where people of all backgrounds use bicycles to stay healthy and connected. As one of the oldest bicycling nonprofits in the United States, we build healthy communities by helping thousands of people ride safely. For more information, visit www.CommunityCyclingCenter.org.